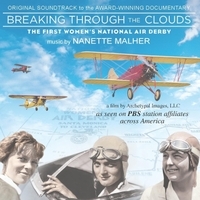 The impassioned orchestral score to the award-winning documentary "Breaking Through the Clouds - "The First Women's National Air Derby" of 1929 takes you through the hair-raising, courageous "winning and losing" moments of the women in the race. In July of 1987, I convinced my sister to get in a car with me and drive 455 miles to Atchison, Kansas to attend the celebration of Amelia Earhart’s 90th birthday. Four hundred women pilots showed up for the four-day, city-wide event. We were not pilots, but I had dreams of becoming one. Bobbi was the last living contestant of the first women’s national air derby of 1929, the event that unfolds in the “Breaking Through the Clouds” documentary. At the end of 2002, Bobbi became gravely ill. The day before she passed away, writer/producer Heather Taylor found Bobbi’s website and emailed to ask if she could speak to Bobbi about the derby. Sadly, I had to report that Bobbi probably wouldn’t make it through the next 24 hours. I spoke to Bobbi for the last time, hours before she passed away, on January 24, 2003. She was 97 years old. My final words to her rang in my ears: “As long as I have breath, I will never let the world forget you and your contributions to aviation.” After giving Heather the bad news, I told her of my promise and vowed to help in whatever way I could with her film. Bobbi had entrusted me with historical items and information, which I shared, along with important aviation contacts. Heather spent the next eight years working diligently on her documentary, I went on to obtain my private pilot license, due in great part to a posthumous gift of flight lessons left to me by Bobbi Trout. In 2004, I was officially "in the left seat.” I shared Bobbi's incredible story in school classrooms, at special events and with anyone who would listen. In 2006, I traveled serendipitously back to Atchison, Kansas to be inducted into the Forest of Friendship for my contributions to aviation through my work with and for Bobbi Trout. As you listen to the music, I hope you’ll place yourself in the soundtrack: Whatever your dream may be, put it out there. Be brave. Take chances. What you will receive, by God’s grace and through the love and kindness of friends and strangers, will awaken you to the amazing life you were meant to live. In turn, you will help fuel the dreams of others. Heather Taylor and I are forever grateful to all 20 women of the first women’s national air derby of 1929, who continue to be inspirations almost 100 years after the fact. One of the finest film composers of our time, Nanette Malher delivers a solid music score for the film "Breaking Through the Clouds". Each of the cues (tracks) is a well-polished gem. I personally consider time listening to this music as time well spent. I just finished listening to this sound track. What a wonderful and creative skill set Nanette Malher has, when it comes to composing and orchestrating for film. A natural gift, by any measure. She has used such a colourful and varied pallet of instruments and sounds, that even without the accompanying film, she captures the era and events perfectly. A five star production.